The twin mills in Ridding, Derbyshire, c.1926. 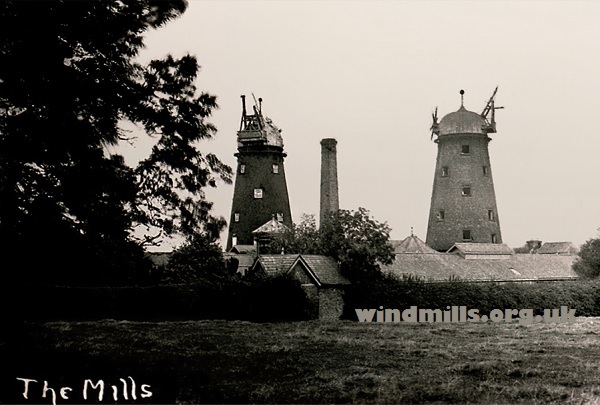 The Riddings windmills were built in 1877 by local landowner James Oakes to run the Oakes Flour Mills. They were given the names James and Sarah. The mills last worked in 1925 and were then used as storerooms. Both mills were demolished in the mid 1960s and a housing estate is now located on the site once occupied by the mills. 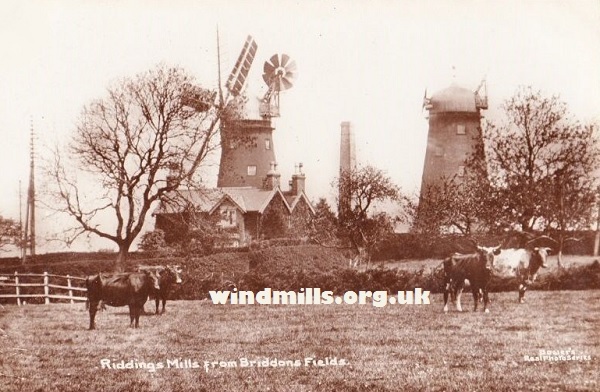 A picture postcard featuring the two Riddings windmills, c.1916. Riddings is a village not far from Alfreton in the county of Derbyshire, England. This entry was posted in Old Images, Windmills and tagged Derbyshire, mills, Riddings on March 7, 2015 by Tower Mill.